Hello and welcome! My name is Nicole, and Dough-eyed is a food blog for people who want to bake for their family and friends in high-altitude areas. Think of me as a friendly voice there with you in the kitchen, here to give you confidence when you’re baking, and to help you with the struggles of baking at high-altitude. Come back every week for new recipes, tips, and advice on high-altitude baking! I started writing this blog many years ago when I lived in Boston for college, but I’ve been baking and cooking my whole life. Both of my parents are amazing cooks, and my grandma was a wonderful baker as well. I often update her beautiful hand-written recipes! These days I am back home in Colorado, a place I’ll never leave, with my amazing husband and a less-small kitchen. Here’s some odds and ends about me! I work in digital marketing, which often leads to me devoting less effort to my SEO on the blog since I spend my days doing it for other people. I always get asked why I’m not working in a bakery or something, but I actually LOVE my day job. I didn’t mean to be in digital marketing. I went to school for journalism, had a reality check, and ended up here. I’ve since thrown myself into the field of SEO and website marketing, and have now concluded that I love it more than I ever loved journalism anyways (whoops). I went to school in Boston, and it made me realize what an amazing place Colorado really is. My husband is my best friend, and we met more than ten years ago. (I’ve got an amazing girl best friend too)! I’m a picky eater. But like, probably worse than you think. I struggle to eat any fruits or veggies in any nutritional way, and the list of things I don’t like is long. I’m trying to branch out more in my adult years, but the struggle has been real. Co-workers are the best taste-testers. I bake more than should be allowed for one household. This means that my co-workers get to reap the benefits, and they have become my taste-testers and wonderful friends to me and to this blog in the last year of my life! I don’t like red wine. I want to, but it just… tastes so bad. I read, like, a lot. That includes listening to podcasts and audio books while I work, which are constant, and reading my favs over and over, like The Dark Tower series, and pretty much anything else by Stephen King. 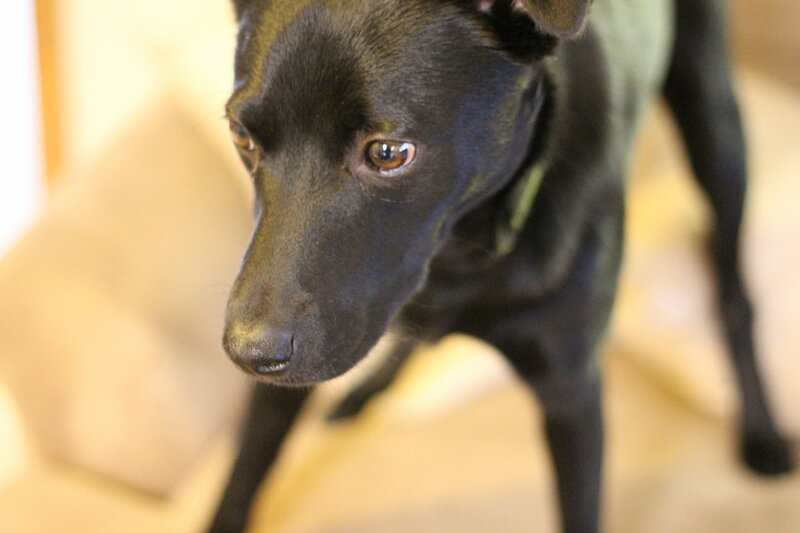 I have an unhealthy obsession with my dog. But seriously, who wouldn’t with a face like this? I so look forward to sharing my baking endeavors with you all, and I hope you come back to visit again soon! I love working with brands that are related to baking, particularly products that are great to use in baking! If you’re a brand interested in working with me, email me at info@dougheyed.com for a media kit- rates are available upon request. I'm trying your recipe for salted caramel blondies from the Colorado Life magazine. Caramel sauce calls for 1 cup sugar and 1/4 cup water, boil til it is dark golden brown. Should there be more water? Mine turned to a brick of sugar before changing color. Hi Teresa! Caramel is a difficult thing to make for sure- however you should not need more water. I think in your case, I would try to heat the sugar up a bit more slowly, and make sure you aren't stirring!! I hope that helps! I recently started a group on Facebook and am hoping to get a good community of local Denver food writers to join. If you want to meet some other area writers (possibly away from the computer screen glow), check it out and feel free to join it on Facebook. Also, feel free to pass it on to other food writers in the area that you know! I am reaching out to let you know that Natural Grocers is remodeling its store in Arvada, and in light of the remodel, Natural Grocers is hosting a private VIP lunch and we would love for you to join us. Could you send your email address so we can send you the official invite? Please let me know if you have any questions or concerns and I look forward to hearing from you! Hi Nicole, I work with your dad and he recommended your blog for some dessert ideas; I can't wait to try them out. Your website and pictures look wonderful! Keep up the hard work, great job! Aww thanks so much Amanda! Hope you enjoy the recipes! You site is really set up well, I'm working on mine but for me it's a slow process. Thank you for your wonderful recipes, I'm sure I'll visit often. Thanks Bee, I'm so glad you are enjoying it! Hi Nicole! I'm an editor at DiningOut and we're doing a round-up of Colorado food bloggers. Is there an email address for you where I could send over a few questions for the story? So sorry- I just saw this! My email is nmespinosa12@gmail.com if you'd still like to get in touch! Hi Nicole! 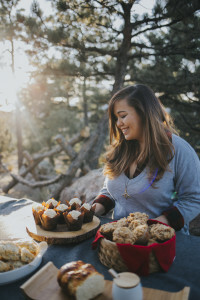 Your blog was my first intro to high altitude baking after moving to Colorado 3 years ago, and now its my go-to blog for any dessert. It is zucchini season, do you have a favorite zucchini bread recipe? Keep up the great work! Hi Laura!! It's so good to hear from you, I'm excited that you've been visiting me here for 3 years! Wow! I don't have a zucchini bread up right now, but I've got a list going of fall recipes to work on, and I'll put that at the top! If you aren't already email subscribed, that will let you know exactly when the recipe is up! Thanks again! I saw that you work in Digital Marketing and more specifically SEO and wanted to reach out! Every month for outreach, we create an infographic on a topic to try and raise awareness. With the summer approaching and everyone wanting to be more health conscious and nutrition-friendly, we have created a graphic with food replacement hacks and tips for healthy eating that can help transform meals and the way you look at nutrition.. I was wondering if you would like to check out the graphic and possibly share it on your website? I think this could be a great opportunity to help your blog with SEO. Let me know and I can send it right on over! Your stuff looks amazing! I tried the drop sugar cookies and was amazing 🙂 Just to check – is everything on your site for high altitude baking? Hi Rachel! I'm so glad the cookies turned out well for you! Yes, everything is high altitude as I live in the Denver area, so there's no getting around it haha! Hope that helps! LOOK at you Nicole!!! You and your new cookbook. Few people know they NEED this cookbook if they want to live at altitude and be successful at baking. I can't believe you did this and you are a picky eater!! Quite the accomplishment! Sad that I missed the book signing at Aspen Grove! I will seek out the book becauseI know I need it!! Cheers! I want to make some of your recipes that I see in Colorado Life magazine, but don't live at high altitude. How do I convert the recipe. Hi Mary!! Since I live at altitude, I can't confirm that these changes will definitely work for you, but I would try to increase the leavener by 1/8th tsp. on everything, and reduce the flour by 2-3 tbs. For the bread, you will likely need longer rise times as well. I hope that's helpful, but the recipes were all developed at altitude!! Thank you!! I just tried your Salted Caramel Blondies in the Colorado Life magazine this month. Was there a printing error? I couldn't make the caramel sauce as stated. It never darkened then hardened to a rock. I think it has ruined my pan! Oh no!! I'm so sorry to hear that! Caramel is one of the hardest things to make actually, and I know there are a lot of potential road blocks! In this case, it's my best guess that the heat was too high- you want to get the mixture to a boil fairly slowly, and you have to make absolutely sure not to stir it! I'm so sorry- I hope that helps!! Ive never had any luck with peanut brittle in Denver. Any chance you have a recipe to share? My dad would be thrilled when he visits from the east coast. Thank you for publishing Sugar High. I live at 8200 ft. so baking is even more challenging. I just made the Sugar Cookie Bars. A little more tweaking and I may reach perfection. I was wondering if you have advise for reducing sugar or using substitutes (ie Truvia baking blend). Hi Gail! I'm so glad you're enjoying the book!! So for sugar swapping, it depends on the substitute you are using. But I have used Truvia baking blend before (though not regularly) and the sub should be 1/2 cup Truvia equals 1 cup sugar. I hope that helps! !